Using the new Raspberry Pi (896-8660) and PI Noir camera (913-2673) for time-lapse photography of creatures that move in the night. The extended spectral range of the Pi NoIR means that it can be put to use in all manner of interesting applications. The project described here used it with a source of infrared illumination to create a simple night-vision camera. Since the aim was to have something that could be left untethered and outdoors overnight, a waterproof enclosure (773-9632) was used to house the electronics and with a rechargeable 10400mAh Li-Ion battery pack (775-7517) for power. An infrared LED cluster (773-2899) provided a source of illumination and was attached to a heatstink (780-5928) for cooling, with power supplied via a constant current LED driver (706-3238). A circular hole was cut in the enclosure and the reflector from a torch glued into this, and a glass window glued onto the outside. The Pi NoIR camera was affixed next to the infrared light source and a piece of transparent plastic packaging material taped over a smaller hole to provide a window. 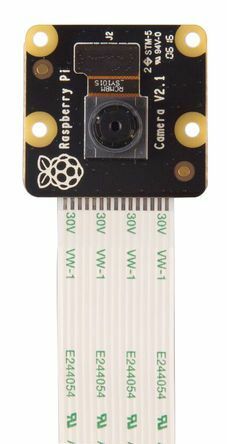 Details of the time-lapse scripts used can be found in the blog post from May of this year, Time-lapse Photography with the Raspberry Pi Camera. For the first run the camera was positioned pointing at a somewhat overgrown lawn. A still image was captured every ~10 seconds and the following morning a video compiled from these using mencoder (as described in the above linked blog post). The result can be seen below. Perhaps not surprisingly, slugs and bugs feature mostly! For some reason, every now and again a bright red toned still was captured, which accounts for the red flash frames in the video. I'm not quite sure why this is, but it could easily be due to the way I have things set up. For a second run I positioned the camera on a wall and pointing into a bramble bush. Once again, slugs! This time there seem to have been fewer and much less intense flashes for some reason. More testing is required in order to try and ascertain the cause of the flashes, and it may be that the red activity indicator LED on the camera board is reflecting off the enclosure and onto the lens. Another possibility is that the spacers used to mount the camera board are just that bit too short, and pressure on the camera module is pushing the plug out of the socket on the camera PCB. I'm not getting quite the intensity of illumination that I'd expected, but this could be due to the reflector used with the LED cluster — which came from a cheap torch and has incredibly thin silvering that easily comes off — and/or the glass window, or the plastic one for the camera; these all have unknown optical qualities at IR wavelengths. Alternatively, it may be that the LED cluster isn't getting sufficient power, and as a next step I plan to measure the actual current supplied to it. While slugs are not the most exciting creatures, the initial results were promising, and once I've seen if I can improve the performance a little I plan to try the camera out in local woodland. This is just the tip of the iceberg when it comes to uses for an infrared sensitive camera, and I can't wait to see what people will build with the Pi Noir! Note: those who wish to construct something similar to the setup described here are advised to more thoroughly investigate the options available for infrared illumination, as there may be more cost effective and/or better performing configurations. Hi,. Not sure if you have altered some of your blog articles, but the link (Time-lapse Photography with the Raspberry Pi Camera) redirects you to the https://www.rs-online.com/designspark/raspberry-pi page! I've seen the pink images with an old, IR modified, Pi camera. The luminance histogram for consecutive images appears identical so I set the camera to grayscale only. Interestingly, although the red frames are a surprise, the pink hue is what i would expect from the sensor. Great project, something I am trying to do myself at the moment and currently investigating battery power options. Just wondering how many hours of life did you get out of the battery pack you used when the camera was running? (and I presume the IR light module)? @doriena The prototype I received was just the camera module and I swapped this with the one attached to the PCB of a standard camera. So as I said, yes, it has the red LED and I wondered if this caused the flashes. There is no infrared mode AFAIK, unless the camera applications have or are going to be updated that is. Does the Noir have a red dot LED (Cam active) like the normal piCam? Maybe this is what causes the red Images. The cam then sometimes changes from IR to normal mode and captures the Reflection of the red Light in the piece of plastic used to protect the Lense. Using a Raspberry Pi to build an Internet radio that only receives BBC Radio 4. After getting MAME going on my Raspberry Pi so that I could play old arcade games. I wanted to hook up a proper joystick.